Tarantulas—they're big, hairy, and intimidating to many. To others they make fascinating pets. Reading a tarantula's body language can help you understand his mood and his next move. Feeling his vibe helps you interact with your spider without getting bitten or irritated by some nasty tarantula fur. When a tarantula sits on the ground with his legs bent but not tucked and his abdomen level, this means he's at peace. In this position he is comfortable with his surroundings. However, even a small disturbance can shatter this state of serenity. A tarantula who's only mildly annoyed with an intruder will adopt a passive defensive stance. When the spider lifts one or two legs, this is considered a first warning to a potential predator. In this stance the spider's body remains relaxed but the raised legs are tensed. When a tarantula stands with his first two legs and pedipalps fully extended into the air and his thorax lifted, this indicates he's seriously agitated. This aggressive stance is usually the precursor to a strike. Most tarantulas aren't quick to bite, but if someone tries to approach a tarantula in this state, the intruder will likely feel some angry fangs. Old World tarantulas (from Africa and Asia) are more likely to bite than New World tarantulas (North, Central and South American species) because Old World tarantulas don't have urticate hairs to use as a defense. If a tarantula faces his back legs toward you and rubs his legs against his abdomen, he's releasing urticating hairs in your general direction. Urticating, or irritating, hairs are a means of defense for New World tarantulas. These hairs cause a stinging sensation on the would-be attacker's skin or mucous membranes. It's important to avoid getting these hairs on you, because they can cause serious irritation. The species Brachypelma smithi is known for resorting to this defense mechanism more quickly than others. The Goliath Bird Eater (Theraphosa blondi), aka the largest spider in the world, has extremely irritating urticate hairs. Another of the tarantula's defensive postures is to tighten all his limbs toward his abdomen. This stance is taken when the spider opts to hide from a predator rather than attack. This stance is different from that of a spider whose legs are curled underneath him but aren't tight. Curled legs are a sign of dehydration, caused by insufficient water or humidity in the terrarium. If a spider spends a lot of time standing over his water dish this is another warning flag for dehydration. Tarantulas use their legs to groom themselves. Sometimes they really need to contort their bodies to clean all the hard-to-reach places. The spider smooths his bristles and removes any parasites by licking his feet and running them over his body. The first sign that a molt is coming on is that the spider seems exceptionally slow and refuses food. 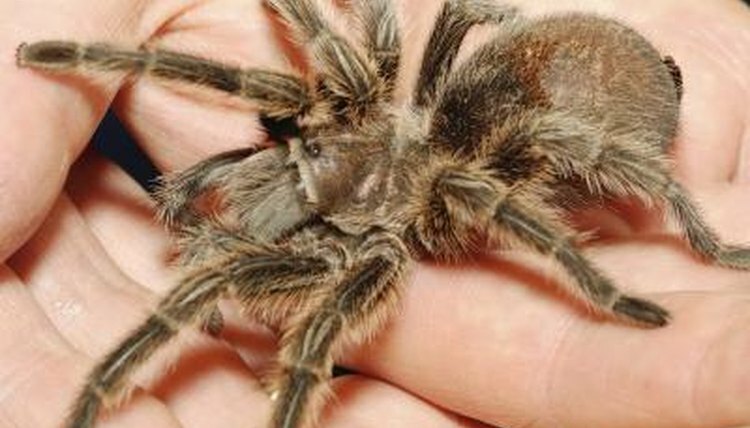 Tarantulas may go months without food before a molt. When the tarantula turns over and lies flat on his back, this means the molt is imminent. During the molt the spider pushes his body through the old exoskeleton and then emerges from underneath. Cornell University College of Agriculture and Life Sciences -- Department of Entomology: Tarantulas: Terrible or Terrific!